Highly detailed artwork in smaller scale of the “Corvette Grand Sport” script on the front left of chest. 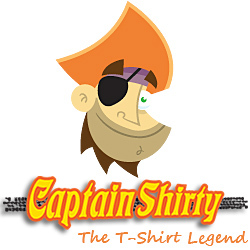 The smaller artwork on the front of this T’shirt has the C6 Corvette racing flags badge emblem in factory colours, with the ‘Corvette Grand Sport’ script below the emblem, in red and white font. White racing stripes finish the background on this smaller scale artwork, Note: No vehicle artwork is on the front of this Tee. The artwork is of 3 different generations from the Corvette Grand Sport family, introduced by Chevrolet. Firstly, we have the C2 Corvette Grand Sport “George Wintersteen” 1963 Grand Sport Chassis 002 in number 12 Livery. The attention to detail is accurate with the racing livery, racing wheels and tyre combinations, and those fat blue side pipes. Check out the unusual rollover rear bar and modified windscreen detail. Just brilliant! Often referred to as an enigma in motor racing history the Grand Sport was General Motor's contender to Ford's formidable Shelby Cobra. Envisioned by the 'father of the Corvette', the late Zora Arkus-Duntov, these top secret, hand-built race cars were designed to win at FIA endurance races and ultimately the 24 Hours of Le Mans. Only five were built out of an expected 120 car run before GM canceled its competition activities in early 1964. Nevertheless, the extreme performance derived from high horsepower and lightweight construction realized Duntov's ultimate conception of the Corvette. Previously owned by Roger Penske, the owner of Penske Racing, and successful racing driver George Wintersteen, 002 is one of just two roadsters produced out of the original five prototypes, making it even rarer than its siblings. While the Grand Sports often had different engines, apparently the most potent powerplant was a 550hp (410kW) V8 unit. In a car as light as the Grand Sport - which had a target racing weight of just 1,800lb (818kg), this would have given the Grand Sport some serious performance credentials, in a straight line at least. Supposedly, the Grand Sport's aerodynamics were not completely honed for high-speed handling and could cause some hairy situations at times. The second beauty of this fine line up, is this magnificent Blue with white racing stripes C4 Corvette Grand Sport of 1996. Very accurate in artwork detail, from the factory red interior seen through that aerodynamic glass, the period correct red two stripes along the front LH wheel guard, and those brilliant factory ‘black’ sports wheels. Just gorgeous! Chevrolet released the Grand Sport (GS) version in 1996 to mark the end of production of the C4 Corvette. The Grand Sport moniker is a nod to the original Grand Sport model produced in 1963. A total of 1,000 GS Corvettes were produced, 810 as coupes and 190 as convertibles. The 1996 GS came with the high-performance LT4 V8 engine, producing 330 hp (246 kW) and 340 lb·ft (461 N·m) of torque. The Grand Sport came only in Admiral Blue with a white stripe down the middle, and black wheels and two red stripes on the front driver's side wheel arch added to its distinctive look. Enter the beautiful red 2010 C6 Corvette Grand Sport in brilliant factory trim. The artwork here is fantastic, from the front grille and nose assembly detail, the side skirts and vents detail, through to the factory correct polished sports wheels and front brake calliper and rotor details. The 2010 Grand Sport was unveiled at the 12th annual C5/C6 Corvette Birthday Bash, held at the National Corvette Museum. The Grand Sport equipment package replaced the previous Z51 package and includes the following: Wider front and rear fenders – including specific front fenders with integrated Grand Sport badges, Z06 front splitter and rear spoiler, Functional brake ducts and extra cooling, Unique 18-inch front and 19-inch rear wheels; painted finish standard and chrome finish optional, Large 275/35ZR18 tires in front and 325/30ZR19 tires in the rear, Z06 brakes, including 355 mm (14.0 in) front rotors with 6-piston calipers and 340 mm (13 in) rear rotors with 4-piston calipers, Dry-sump oil system (Coupes equipped with manual transmissions only), Specific manual transmission gear ratios, Specific rear axle ratio on automatic-equipped models. The Grand Sport can be ordered with 1LT, 2LT, 3LT and 4LT trim packages. 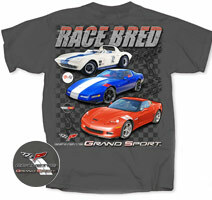 The background of the Tee illustrates the typical homage to the Corvette Grand Sport Racing History. The large script colour above & below the artwork of ‘RACE BRED’, is grey with red racing stripes. The script gives the impression of speed. The background is of a ‘ghost like’ chequered flag, with subtle pin striping. You will note the individual generations of the 3 Corvette racing flag badge emblems from C2, C4 and C6 era within the artwork.